Supporters of the left-wing People’s Democratic Party. July 7, 2015 – Links International Journal of Socialist Renewal -- One month after Turkey’s June 7 parliamentary elections, the country still does not have a government. Ahmet Davutoglu of the Justice and Development Party (AKP) remains caretaker prime minister. 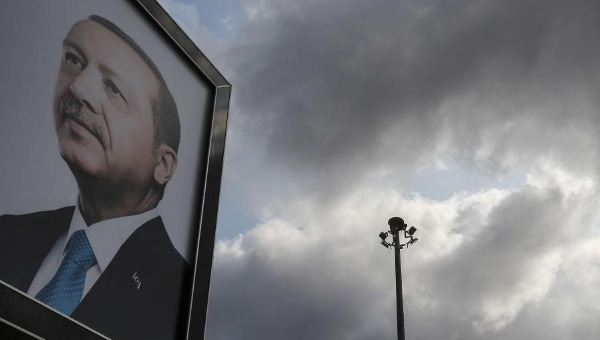 President Recep Tayyip Erdogan remains the dominant figure in the AKP and is actively manoeuvring to retain his party’s leading position. The president is supposed to be an impartial figure above party politics but Erdogan pays scant regard to such constitutional niceties. The elections were marked by two significant and related developments. 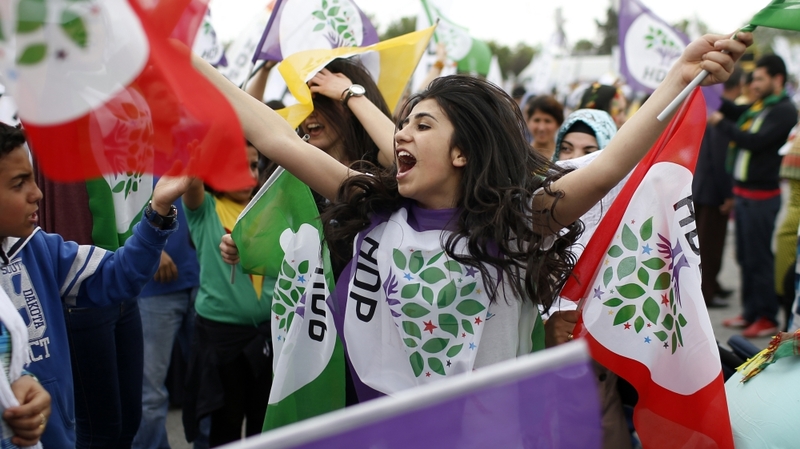 For more on the struggle of the Kurdish people and the Peoples’ Democracy Party (HDP). June 6, 2015 -- LeftEast, posted at Links International Journal of Socialist Renewal -- With Turkey’s June 7 parliamentary elections fast approaching, all eyes are on the Peoples’ Democracy Party (HDP) contesting its first ever election as a party, rather than a coalition of nominally independent candidates: a momentous decision on the part of the party leadership, which stands to gain clout in parliament and solidify its position as the electoral standard-bearer of the radical Left—or fall below the constitutionally mandated 10% barrier and be excluded from parliament entirely. 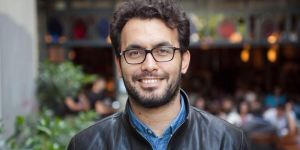 May 25, 2015 -- Green Left Weekly, posted at Links International Journal of Socialist Renewal -- The June 7 elections to Turkey’s Grand National Assembly are shaping up to be the most important in a long time. 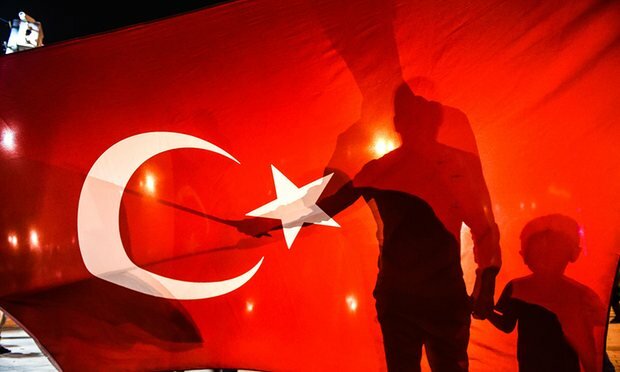 The bold decision of the People’s Democratic Party (HDP) to run as a party and strive to exceed the grossly undemocratic 10% threshold needed to win representation in parliament has put the group at the political centre stage. Although its key support base lies in the oppressed Kurdish community, the HDP is reaching out to all those oppressed, exploited and discriminated against across the country. This includes women, workers, the Alevi religious community, Armenians, Assyrians and LGBTI people. Support for the ruling Justice and Development Party (AKP) has clearly slipped since the 2011 elections. The AKP will almost certainly gain the most seats, but the HDP's rise will deny it any chance of the super-majority needed to unilaterally amend the constitution through parliament. AKP leader Recip Tayyip Erdogan, the country’s supposedly impartial president, wants to establish a dictatorial executive presidency. This ambition appears to be doomed. Kurds rally to defend Kobane from IS killers. October 3, 2014 -- HDP, posted at Links International Journal of Socialist Renewal -- Today the peoples of the Middle East face the threat of a large-scale massacre. Peoples of the region, particularly Syrian and Iraqi peoples, are putting up an historic resistance to ISIS terror. Heavy attacks by ISIS, especially on the Kobane Canton of Rojava, are being resisted by the people of Kobane and YPG forces. The defence of Kobane, under the siege from four sides, continues. The People’s Democracy Party (HDP) leader Selahattin Demirtas, who won nearly 10% in the recent presidential election. The HDP is leading a big campaign of solidarity with Rojava against the IS assault. September 27, 2014 -- Green Left Weekly/Links International Journal of Socialist Renewal -- Besieged since September 15, the northern Syrian Kurdish-majority city of Kobanê (Arabic name: Ayn al-Arab) has mounted an heroic, all-out resistance to the murderous 'Islamic State' (IS, formerly referred to as "ISIS") gangs. As of September 25, despite all the superior heavy weaponry deployed by the IS, it appears that fierce resistance and determined counterattacks have halted or slowed the assault. Nonetheless, the IS thugs have pushed closer to the city centre than ever before and the situation remains perilous. Kurdish fighters after liberating Maxmur. September 2, 2014 – Links International Journal of Socialist Renewal -- Across northern Syria and Iraq, Kurdish forces are locked in fierce battles with the murderous “Islamic State” (IS) armed force. Whether directly or indirectly, the whole Kurdish people is being drawn into this struggle. In late August the Syrian Kurdish resistance forces announced they had defeated an IS push around the town of Jazaa in north-eastern Syria, close to the Iraq border. Hundreds of IS fighters were killed in the August 19-31 battles. The IS attempted to cut off the YPG-YPJ (People’s Defence Units-Women’s Defence Units — the military arm of Rojava, the Kurdish liberated area in northern Syria) from their forces over the border in Shengal (Arabic name: Sinjar). The IS wants to establish a corridor linking Mosul and its possessions in Iraq with Al-Raqqa, its main stronghold in Syria.